I have been on a 100% raw vegan fruitarian diet twice in my life now and it has totally transformed everything in my life. It gave me my life back when I was at rock bottom with debilitating health problems. I can’t tell you how happy I am to have discovered that something so simple would create such unbelievable changes in my life. Today I’m sharing my own personal transformational story with you. This book transformed my entire life. It will tell you everything you need to know about what we’re designed to eat, what to eat, how much to eat, when to eat and what to expect when you transition to this lifestyle. 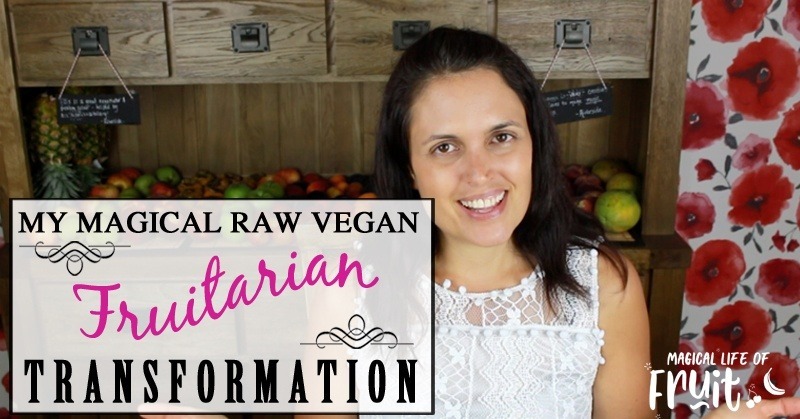 Hi there, Katherine here from Magical Life of Fruit and today I’m going to be sharing my complete transformation with you, my personal story about how I got into being a raw vegan, a fruitarian, what happened, why I went down that path, why I only eat mainly fruit now, and what it did to me, and what the results were. So, let’s go and hear about my magical life of fruit. So, it all started about 10 years ago, it was just after I got married and I got really really sick. I had chronic fatigue syndrome, I had allergies, IBS, all kinds of problems. I was pretty much bed ridden which is not a very nice way to start a marriage. I went to the doctor who said, you’re never going to recover from these things, you’re always going to have these problems, and I just went home and thought no way am I going to be like this for the rest of my life, I just can’t imagine my life like this, this is no quality of life whatsoever. So, I decided to take matters into my own hands and I started doing lots of research. I went onto Amazon, started buying books. Amazon, once you buy one kind of healthy book they recommend other ones. I got lead down a little path. So, it started off I gave up gluten, dairy and became a vegan. So, they were the first steps that I took, and I did notice quite a big transformation when I did this. Within about two weeks my severe asthma had gone, my eczema had gone, my hay fever, and constant allergies that were just there 24/7 had completely gone overnight, and within two weeks. I had this kind of itching on my skin, and all the toxins must have been coming out, and after that I was free of annoyances shall we say. most of my health problems went away. I still had some problems left, like my chronic fatigue syndrome was still there, even after about a year of being vegan it didn’t go away. So, then I got reading about raw food and I realised that I didn’t have enough raw food in my diet. I didn’t have enough fruit, I didn’t have any leafy greens in my diet. So, I started on a raw food diet and I started a low-fat raw vegan diet, like an 80/10/10 style diet. I’ll give all the links within the blog post that accompanies this video so you can see what I did. I started eating this way, which is pretty much I had green smoothies for breakfast and for lunch, or some other type of smoothie, or some other type of fruit, basically just fruit, or fruit with leafy greens for my first two meals of the day, and then I might have some more fruit later on as a snack and then for the evening meal I would have a salad. Just a raw salad with salad leaves, cucumbers, tomatoes, vegetables and some tender little fat, like some nuts and seeds. So basically, raw vegan healthy, low fat lifestyle. I went through a detox which lasted about three months, a long time. it was a hard detox because I’ve never really detoxed in my life, I’d never really tried to go healthy, this was the first time I’d ever really tried to go extremely healthy. So, it took three months to get everything out of my system, and then I went from having to lie down in bed, I could barely even take a bath, I used to have to go and lie down after taking a bath because I’d be shaking that much. All my skin was just a big mess, allergic to everything, I was allergic to water. it got really crazy and then within three months I had so much energy I was actually running for an hour every day and then I was coming home and doing weights after that because I just felt absolutely amazing. I just had so much energy to burn. I’d never felt like this in my entire life and I used to be an energetic person. I used to do a lot of exercise before I had the chronic fatigue syndrome. I used to be quite fit and healthy, but I had never ever experienced energy on this level, it was just crazy, it was like there was nothing that could tire me out. it was unbelievable that it happened so fast, and on top of that, another amazing side effect of being on this diet was the weight loss. I actually lost about five stone which is about 56 pounds, I dropped about five dress sizes in just a few months, most of it, not completely all of it, most of it came off within just three or four months of being on this diet, which was absolutely amazing. I can’t tell you how good I felt, how healthy I felt just all kinds of health problems went away. At one point I went to the doctors and I had a list of 50 health problems on this list which was crazy and he just said, I just don’t have time to deal with all this stuff. We just don’t know what’s causing all these things. One of them was a severe sun allergy, I used to go out in the sun for five minutes, and I would burn. I would get sun stroke, heat stroke, I’d get a banging headache, I’d feel dizzy like I was going to pass out. I’d have to go and lie down for the rest of the day and I’d get like that every single time I went out in the sun. After being on the raw diet for just, I think it was just about a few weeks to a month, we had a lovely hot spell in the UK and I was sitting out in the sun all day long for an entire week and I thought, wow I can not only tolerate the sun, I feel amazing in the sun. It just feels right, I feel really good. I’d go out with my husband and my friends and they’d all be too hot and sweltering and saying, oh I feel like I’m going to pass out, I feel really hot, and I’d be just amazing, feeling like I could run in the sun and I could do anything I wanted, and I never felt that same way again in the sunshine. So, I had all of these benefits and I could probably write a book about how many benefits I actually received after changing to this lifestyle. I felt so good I never ever planned to come off this lifestyle, and unfortunately, I did come off the lifestyle. I did come off the diet. What happened was I ended up going on a holiday, like a packaged vacation with my family, it was the first time I’d ever been to one of these all-inclusive type beach holidays and I didn’t really know what to expect but people had said, there’s always loads of fruit there. They have all these buffets with fruit on them, you’ll be able to keep eating your diet no problem. So, I thought, that sounds great. So, we went there and it turns out that there wasn’t really any fruit. There was a few little tinned fruits in syrup, there was some dates covered in glucose, and there was a few little items with fruit dotted around and when I bit into them all they were all rotten. So, I tried very hard to find fruit, we were on the island of Gran Canaria and I remember speaking to the hotel manager and he said the nearest place you can buy fruit is an hours walk. So, I walked to the market, bought all this fruit, I thought great I’m stocked up now. So, I got back to the hotel room, started kind of chopping it up and preparing it, and making it into smoothies and stuff and it was all rotten inside as well. So, I spoke to the manager and he said that’s all the quality of fruit we get here, even though we actually grow all the fruit ourselves, we get the worst stuff because we import it all to other countries like yourselves in the UK. So, there’s nothing good left for us here, which was really disappointing considering I’m in the place where they were growing the fruit, and I just couldn’t figure out how to get anymore fruit. So, I just kind of gave up at that point and started eating the buffet food, all the junk food that was on the buffet, and of course I got really ill. I had stomach bug type symptoms, for the last two days of the holiday. I had enough fruit that I’d brought over with me that lasted quite a few days which was good but then the last two days I was really ill eating this unhealthy food and as soon as I started to eat the junk food I got immediate cravings which I hadn’t had the whole time I’d been raw vegan. I got immediate cravings for more junk food and I kept shovelling it in, I just couldn’t seem to stop myself, I got out of control. So, I was really, really ill and then just felt so low, so depressed after. It was a horrible, horrible feeling. Went home still feeling ill, had a bit of a family bust up at that time as well, which was really really unpleasant, so my mental health, my state of mental health was really really low. I was so so depressed and when I got home I did think, right I’m going to go back to the raw food diet again because that’s what I need, I’m so ill, I’m so down. So, I tried really hard, I made smoothies, I forced them down but I felt funny. I just didn’t feel the same, I felt like no food was going down. I couldn’t stomach healthy food, just the site of my green smoothies was making me feel nauseous and I’d never felt like that before about my green smoothies, even just normal smoothies I just could barely stomach them. I just couldn’t really stomach any food at all. This went on for a couple of months, two or three months and then I finally figured out that I was actually pregnant so that was the reason why I was feeling so nauseous, and I’d actually been pregnant on holiday and not realised it, so that made sense to me but my whole pregnancy was just really really hard. I felt really ill throughout the whole thing. I couldn’t function. I don’t know what would have happened if I had have stayed raw instead of eating the cooked food, I really don’t know but I couldn’t get back too … I tried really hard, I did eat a lot of raw food but I couldn’t really get back to it, and then a whole series of mishaps, of trauma, one thing after another happened and my mind just completely went off the raw food diet. I was too consumed with getting through every day, scraping through every day and just feeling awful. Then, after I had the baby I managed to, after really struggling with not having time to make healthy food I managed to devise a smoothie which I call the green thickie, and that’s on my other website which is greenthickies.com, and I put this recipe out there that people could enjoy. It’s a really filling green smoothie, it’s like a complete meal because when I had a baby I was really struggling to get enough calories so I was drinking these green thickies, and I drank loads of them. I would start the day with a green thickie for breakfast, I would have a green thickie for lunch, and then my dinner when my husband got back, I would make like a vegan cooked meal and put that on top of the salad but it was always very healthy. Just cooked vegetables, no kind of vegan junk food or anything like that. All very unprocessed cooked from scratch, very healthy cooked food. So, I managed to feel amazing eating this kind of diet. I lost all my baby weight and I piled back on the weight I’d lost. I lost it all again and I felt amazing. Even though I was really sleep deprived I managed to have just enough energy to look after my baby and it made me feel really happy doing that. So that went really well and then when I got pregnant with my second baby, my son, my health plummeted immediately and I had a really bad pregnancy, in the same way I had the first time around as well. At that point my diet had changed slightly, I’d kind of got into bread making. So, I was making a lot of bread from home, because I was the only one who seemed to eat it, nobody else seemed to like my home-made bread, I was trying to make healthy bread. Rye bread, and wholemeal bread and stuff, and nobody liked it so I always ended up eating it all and a lot of my diet ended up being bread based instead of the healthy fruit based. I’m not sure how that happened but that’s what happened anyway. I became really really sick, I got anaemic, I felt dreadful, went to the doctor had to take iron tablets because I was so anaemic. My iron was so low, and at the time I was friendly with a lot of people who were into a paleo lifestyle and they managed to convince me that my vegan lifestyle that I’d been following was the cause of my illness and that I was deficient in something. That I’d been vegan for too long and I was now seeing the negative effects of the deficiencies of the vegan diet. I did actually believe them at the time which I really wished I hadn’t, because even though I gave birth I still carried on feeling really bad for about a year after I’d given birth, so I didn’t kind of spring back as I did the first time around, so I was inclined to believe that something had changed, that something was a bit different at this point. So, I actually went onto a paleo diet even though I really really didn’t like it, I never have liked eating meat, still don’t like eating meat. I ate a lot of eggs and forced down a little tiny bit of meat in the evenings and I really didn’t enjoy any of it whatsoever. I felt slightly better than I had been because I’d cut out the bread, wasn’t eating anymore bread anymore because the paleo diet doesn’t eat grains. So, I felt a tiny bit better and I wasn’t anaemic anymore but still I felt very lethargic, very tired, I just wasn’t feeling that good and this continued for the next, four or so years, this continued. I continued with this kind of way of eating, a kind of paleo but I did start to have my green thickies again so I’d have my fruit and my leafy greens for breakfast and lunch at least I would have that, and then dinner would be some kind of paleo stew or something like that, which I’d end up picking all the meat out anyway because I really didn’t like it. But unfortunately, my health gradually went downhill, I’d have ups and downs and I’d think, I’m better, no I’m not, and gradually it was like this and my health deteriorated to the point where I ended up with chronic fatigue syndrome again, four years later. Went back to the doctor again and they did a different kind of test on me this time, they did a test for coeliac disease. Coeliac disease is a bit like an allergy to gluten, so any kind of bread products, cakes, pizzas, that kind of thing, anything like that that’s got gluten in it. It’s like an allergy but it’s also an autoimmune disease supposedly, so any gluten ingested will destroy your small intestines and then you can’t absorb any nutrients from food of your general level of health just plummets. It turned out that I actually got diagnosed with coeliac disease much to my surprise but I was actually relieved, because at least I had a reason. I had an answer. So, then I started looking back and thinking that was the reason I was so sick during my second pregnancy because I was eating all this bread and I was allergic to it, so no wonder my health plummeted. I thought it wasn’t the vegan diet after all, so I immediately went vegan again and I stayed vegan for a year after I was diagnosed. I was drinking my green thickies for breakfast, lunch and a cooked vegan dinner, and I did feel an immediate improvement. I felt an immediate improvement in my energy and my vitality, and then what would happen was I’d stick to it for maybe a couple of months and then I’d maybe have a little treat, something processed. Like a vegan, gluten free, dairy free cookie. I’d have one cookie and then I would end up flat on my back again. I think I was allergic to something in the processed food because it didn’t matter which type of processed food I ate then this was always the result. I was getting so annoyed with it, and then finally I just thought, my health is still suffering and I’m going to go back to raw vegan again. Finally, and I’m going to stick with it this time, no more pregnancies, nothing to drag me down. no more gluten, no more bread, no more holidays that I haven’t researched. Nobody that’s going to encourage me to get off this lifestyle because I know that it works really well, it works for me, it works well for hundreds and thousands of other people who are following it. So, the proof is in the pudding as they say, so if you do something and it works for you then stick with it. So that’s what I did, so I have gone back to my raw vegan, fruitarian kind of diet now. At the time of this recording I have been doing it for about four and a half months. Again, I went through about a three-month long detox, which I had colds and flus and just feeling exhausted, achy and painy, and those kinds of things. It got to the point where I was thinking, this is never going to end, am I actually going to recover this time, I’m not sure. and then all of a sudden, I felt amazing, just overnight I felt amazing again. I have started running again, I’ve got my old energy back, my old vitality back and I just feel so, so good. So that is where I am up to now and I never ever plan to quit this lifestyle because it works for me and I just feel so so good, there is no cooked food that is ever worth me being flat on my back, unable to look after my kids, unable to be a good wife, unable to have a good quality of life. Just having such an unpredictable life and not knowing whether I’m going to be well, or if I wake up in the morning, or whether I’m going to feel like I’m dying, or whether I’m going to feel so depressed that I just don’t want to be here anymore. These are the things that I was feeling before, and now I just feel alive, almost every day I feel so so good and if I don’t it’s probably just because I haven’t had a good night’s sleep but I can still get through the day. I’m still fine, I can still go for a run even if I’ve not had a good night sleep, whereas before it would ruin me for a week if I didn’t sleep for one day. So, it’s all good, it’s all looking up. So, I really really want to encourage you, if you have never started this kind of lifestyle before then I would love to help you more. 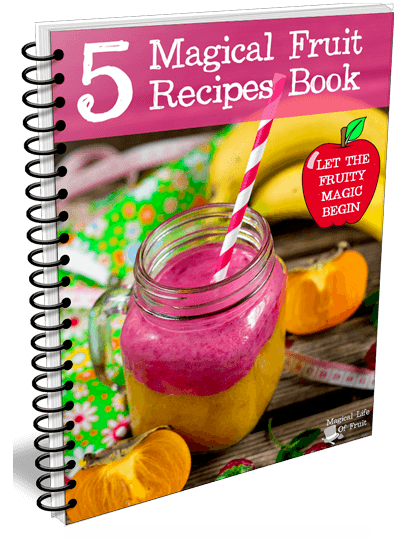 So, I’m producing videos that help you to learn everything you need to learn about fruit and fruity recipes and sharing my own stories with you so that you can help to transform your life in the same kind of way. Also, I have lost weight again the second time, I didn’t have as much weight to lose the second time but I’ve definitely lost about 14, 15, 16 pounds so far and I’ve still got more weight that keeps coming off. It’s coming off quite slowly, at a rate of about one pound a week. So that’s pretty good, I’m happy with that, I’m patient, you know I’m going to be doing this for the rest of my life now so I have got the time to wait and it’s all going well. 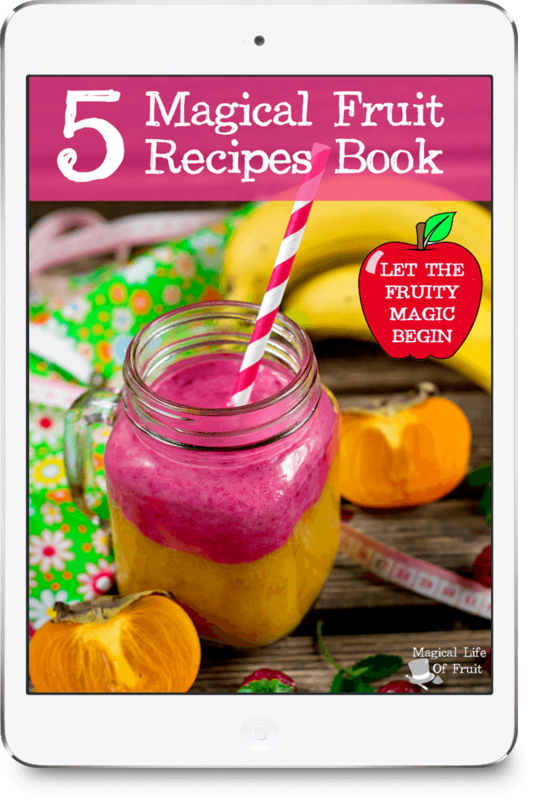 So yes, I have a free recipe book, the magical life of fruit recipe book that if you go to magicallifeoffruit.com you can get it there and you can see the kind of meals that I eat and you can get my recipes so that you can start leading this lifestyle immediately. No time to waste. So, I really want to encourage you to go and make your own magical life of fruit and let me know how it’s going. Leave a message in the comments, tell me what stage you’re up to in your journey and I can’t wait to connect with you. So, take care. See you soon. Well that’s it for today, I hope that you really enjoyed this video and if you did I want to encourage you to like it, to subscribe to magical life of fruit YouTube channel and to share it so that you can spread magical life of fruit message and all the fruity love to help transform other people’s lives. I’d really appreciate that, thank you so much. And, if you want to get any of this month’s special deals which we’ve got in the store this month you can go to magicallifeoffruit.com or click the link below to get those special offers. Until next time, I really hope that you go and make your own magical life of fruit.